Tasha: Hi everyone! I’m Tasha from By Gum, By Golly, and I’m pleased to be here today to share a few tips with you! 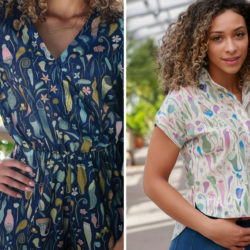 I sew a lot with denim, and I had the opportunity to test out the new Spoonflower Dogwood Denim. I made this pair of slim fitting vintage style pants. You can read all about them here! 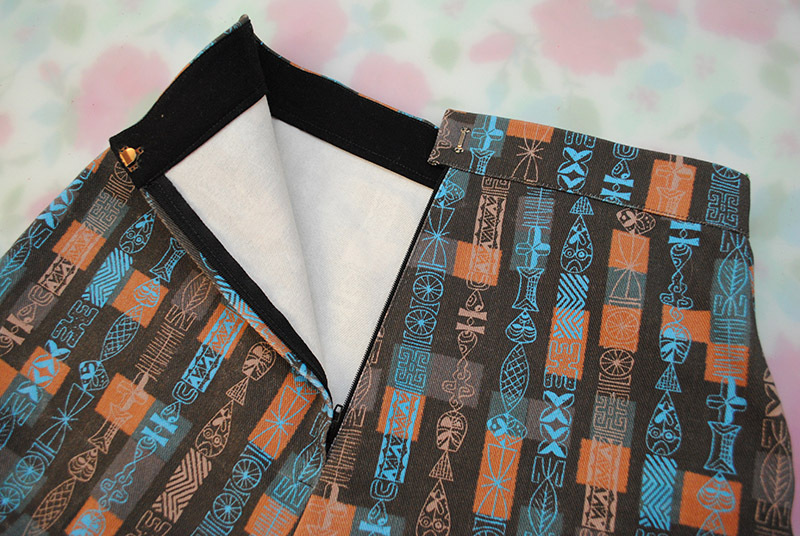 A lot of people are a little hesitant when it comes to sewing heavier weight fabrics, though, but I’ve sewn with enough I have a plan of action that works really well for me. 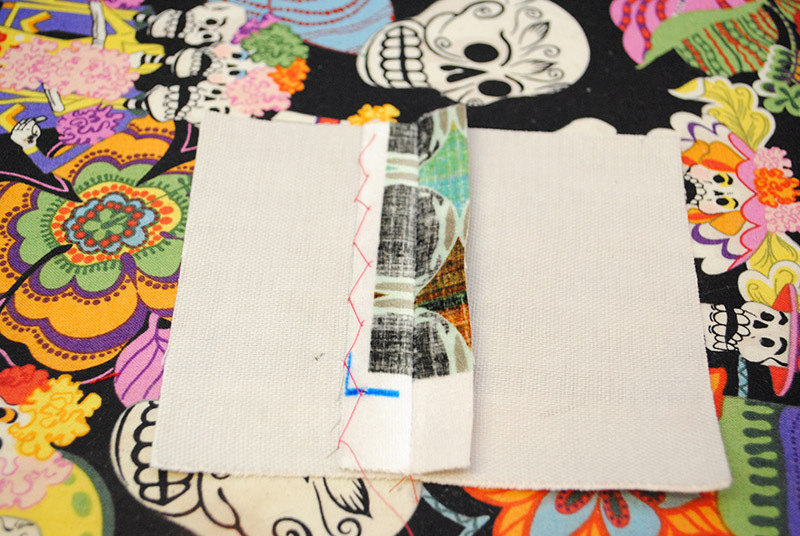 A few simple tips and supplies and you too will be fearlessly sewing beefier fabrics in no time. 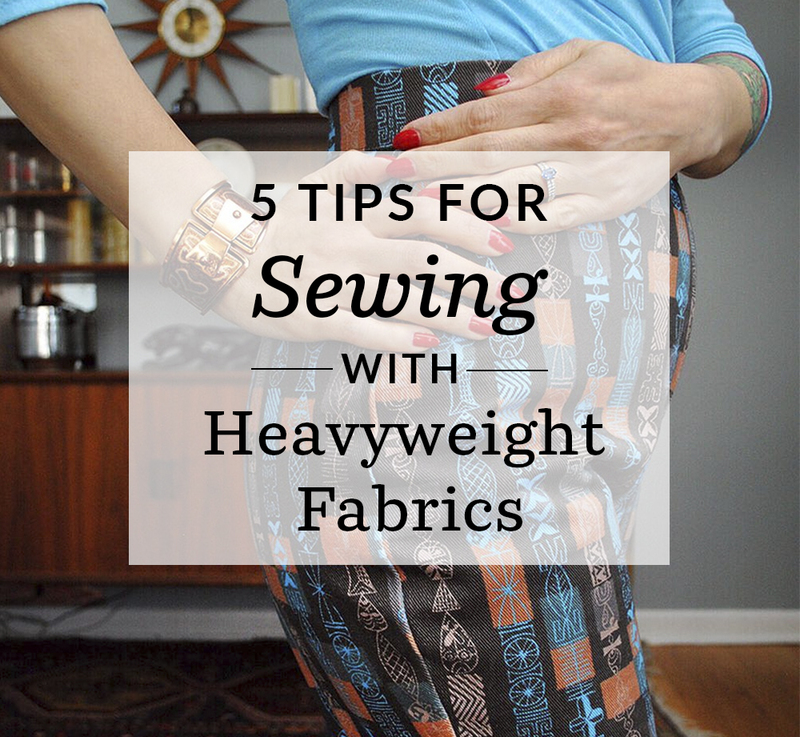 Kind of a no brainer, but make sure to use needles for heavier fabrics! I use Schmetz needles for denim and jeans and they work great on a variety of heavy fabrics. For garments, make facings and pockets in lighter fabric. I didn’t put pockets in my pants as they were a pretty slim fit, but I did use a mid-weight quilting cotton as the facing for my waistband. Even a small difference in weight of fabric for the innards can make a big difference in how a garment lays on the body. Keep that in mind when you’re planning out your project in a heavy fabric. It’s all in the bulky seam intersections. 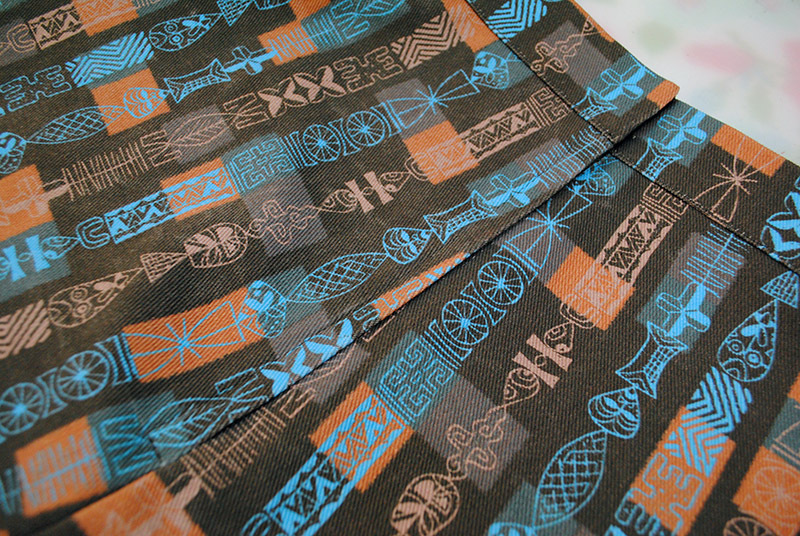 I think one of the biggest obstacles people have when sewing thick fabric is the intersections. They get to somewhere with 4 or more layers of fabric (a crotch seam, edge of a jeans back pocket, etc.) and their machine balks because the presser foot is no longer level. Then they get wonky stitches or a nest of fabric on the bobbin side or worse, a broken needle. Fear not, you just need a “hump jumper”. While you can purchase a little plastic doohicky for this purpose, you can also use basically anything that’s small and flat. My BERNINA came with a plastic tool for this purpose (3 different sizes for different thicknesses), but before that I just used a folded up business card. It’s like a shim for uneven furniture! 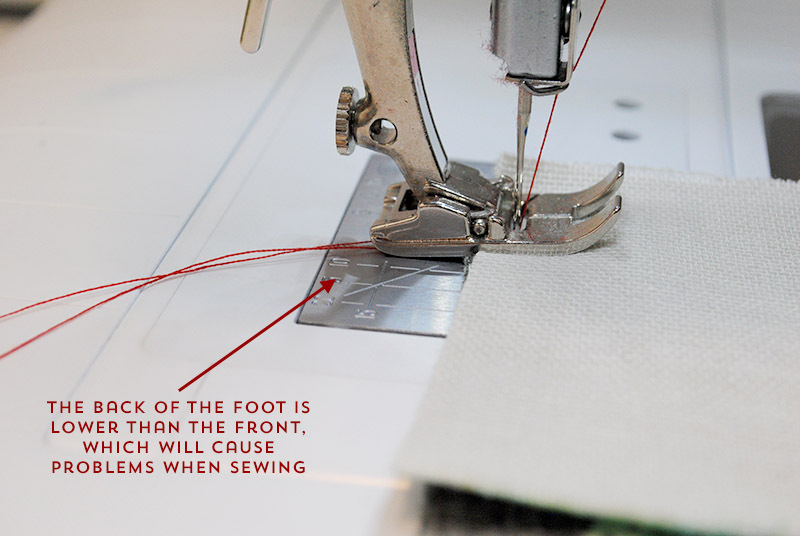 When you are to the point in a seam where your presser foot is starting to be lower at the back than the front (start of a thick seam, intersecting seams, jeans belt loops), that’s when you need a hump jumper to wedge under the back of the foot. Stick it under the bottom of the foot at the back, and it will raise the back of the foot to be level with the front. Slowly stitch forward, and if you need to, stop stitching and give the wedge a little shove forward to keep it under there. Once your foot is back on level “ground”, you’re free and clear. 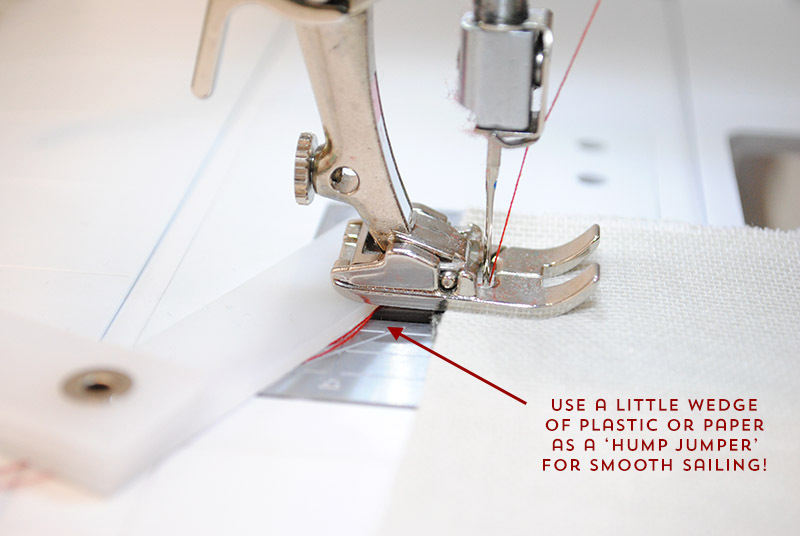 It’s a small step that make a gigantic difference in sewing thick fabrics! How you press and finish seams is key. 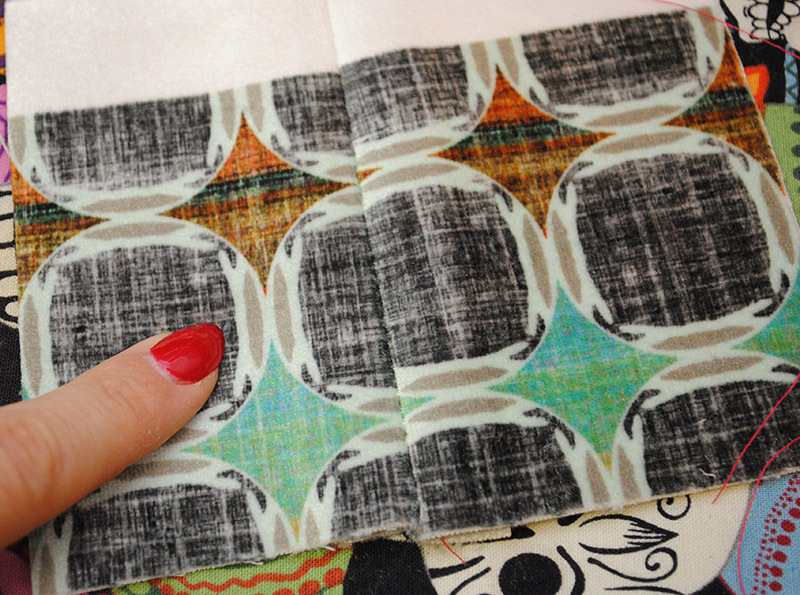 Your fabric will dictate how you can press your seams, but pressing is crucial for heavy fabrics. I’m a big fan of a light touch with the iron but giving a lot of steam, and then finger pressing seams until they’re cool, to get them to lay flat. That way I avoid potentially shining the fabric. 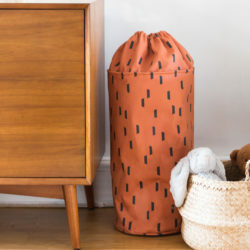 And what if you’re using a poly fabric that can barely take an iron? Steam and pressing is great there, too. But in the case of thick polys like Celosia Velvet™ and (to a lesser extent) Eco Canvas, your seams are probably not going to lay very flat. 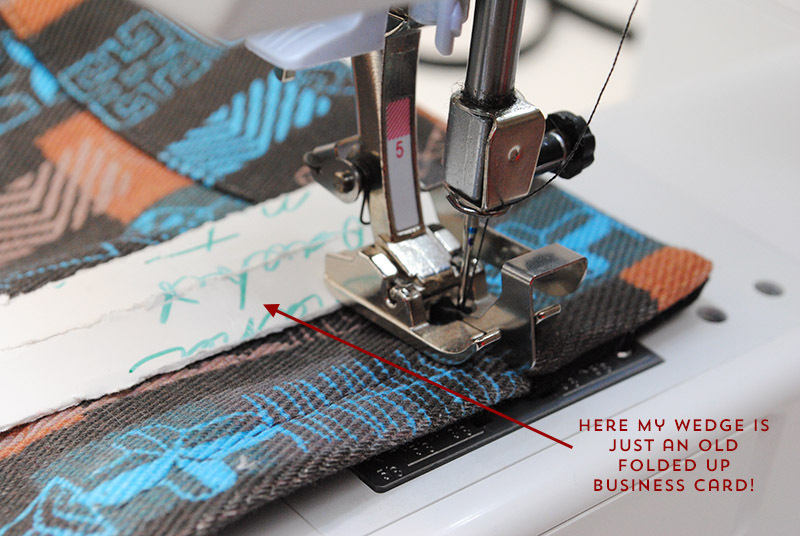 One thing you might consider, if the application allows for it, is catch stitching your seam allowances open. It takes a bit of time, but the difference is noticeable. Below on the left, you can see half a seam allowance in Celosia Velvet where I catch stitched it open, and on the right I didn’t. You can see that side isn’t laying perfectly flat. And from the right side, you can see on the left the catch stitch side is flatter. 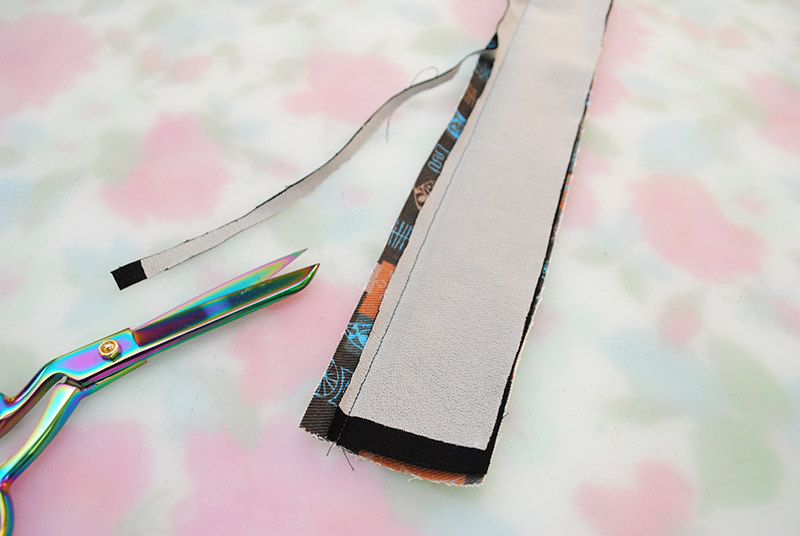 And of course, don’t forget when you’re finishing your seams to trim and grade them! Zippers? Avoid invisible if you can. Invisible zippers are a bit persnickety to begin with. If you’re using denim or other heavy fabrics like the Celosia Velvet, save yourself a lot of swearing and use a traditional zipper. I inserted a lapped zipper, and it was no problem in the Dogwood Denim. Just make sure to diligently press the seam allowances and you’ll get a nice, smooth result. 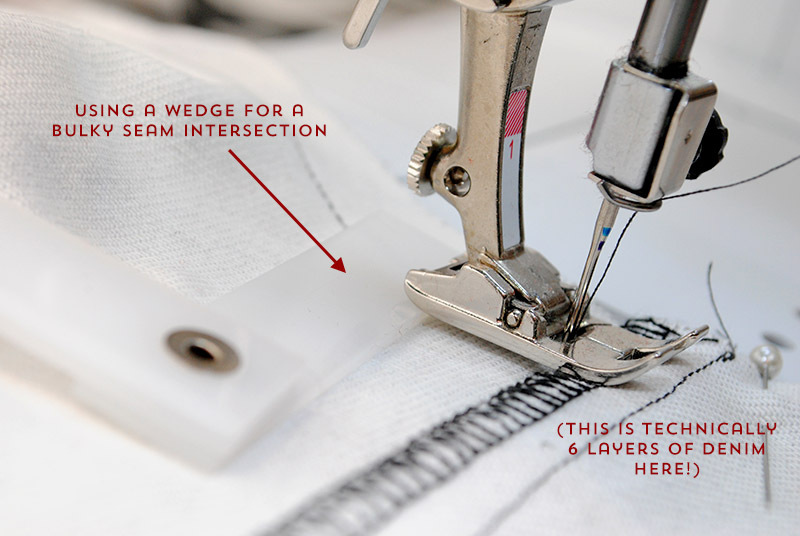 Hopefully these tips will help get you on your way to confidently sewing with heavier fabrics! If you’d like to see more of my Dogwood Denim pants, visit me at By Gum, By Golly. Happy sewing! 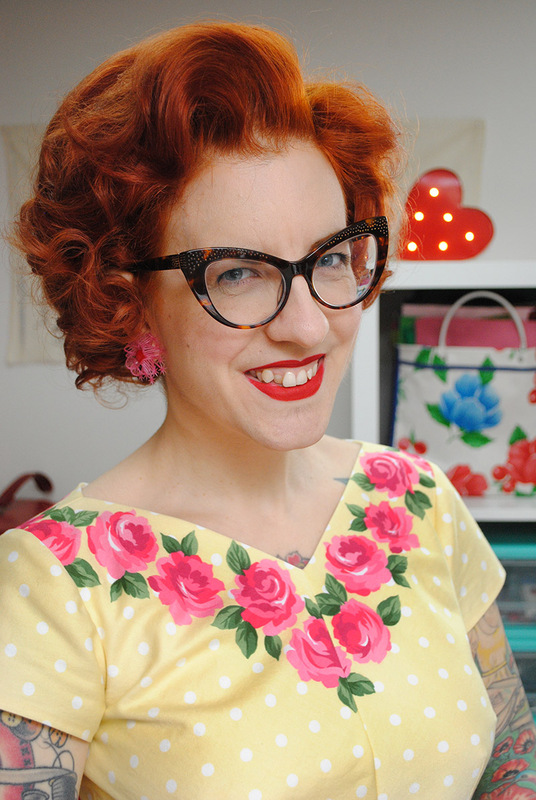 Tasha Moss is the blogger behind By Gum By Golly, a vintage emporium full of her adventures in knitting, sewing and living my life with a bit of vintage flair. Find even more of Tasha’s vintage makes on Instagram. Thanks for the “hump-jumper” tip. I’m going to try it the next time I have an opportunity! Let us know how it goes! We tried it out over the weekend while sewing a denim dress and it worked like a charm. The DYI “hump jumper” is worth the price of admission, folks. Many thanks for the wonderful hack idea! We’re so glad you enjoyed Tasha’s tips and tricks! “Hump jumper” is brilliant! Tx! Hump jumper idea was great! I liked that ironing was a big part of her sewing! I totally believe that also. We love this tip from Tasha! Love those. I’d love know what pattern you used or how to get one. Hump Jumper: Never knew! Almost 5 decades of sewing! Had no idea that so many problems where caused because the pressure foot was not parallel — I’m a believer and haven’t even tried it yet. This tip from Tasha has been a game changer! Love the hump jumper tip. I use the velvet to make bag and I have 8 layers to sew through. I have a pile of broken needles to prove it. I tried it on the bag I was working on and it’s magic. Thank you so much. You just saved me a fortune in needles. That’s so great to hear! We loved this type from Tasha. It’s been so useful for our recent projects that used our Dogwood Denim. The thought of sewing 8 layers would have had us running in the opposite direction but with Tasha’s tip, it’s so much easier!